The new Kindle Paperwhite is a great way to obtain high-quality e-reader features like large storage space, waterproofing, and Audible apps without breaking the bank. E-readers are an amazing way to enjoy an expansive book collection without hauling each physical title around. 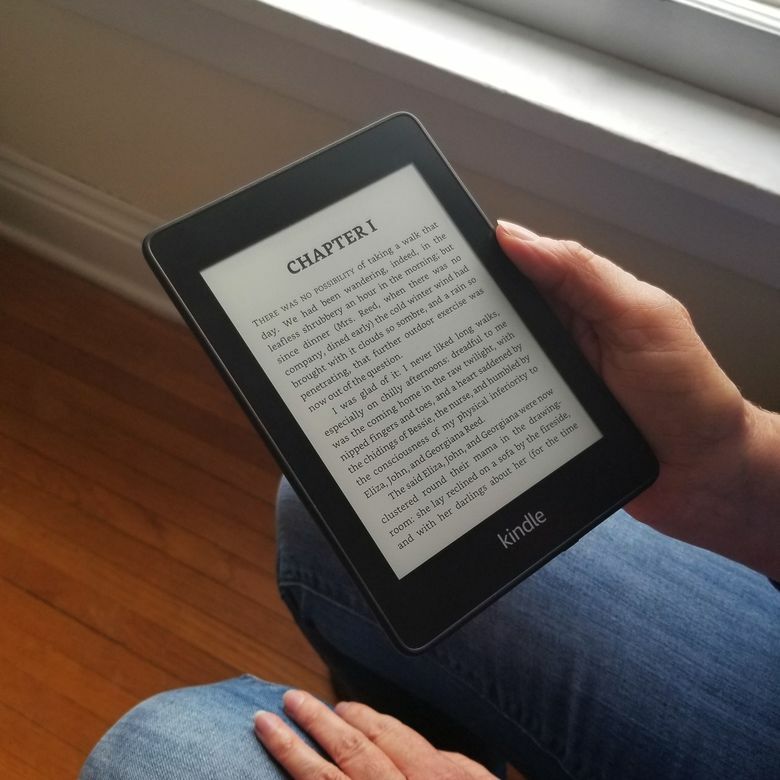 A basic e-reader from Amazon or Kobo won’t cost you too much, but if you want features like waterproofing, audiobook support, and larger storage you’ll have to shell out a bit more. Among the many models, the new Kindle Paperwhite (10th Generation) stands out for offering all these features without breaking the bank. At 6.3 x 4.6 x 0.3 inches (HWD), the Kindle Paperwhite is thinner than a pencil, making it easy to tuck into a bag on your commute. It’s also incredibly light, clocking in at 5.7 ounces, so our arms didn’t ache after extended use. The 6-inch tall screen blends seamlessly into a soft-touch plastic exterior, allowing for easy gripping. Our only issue with the design is that the bezel was too thin, making it too easy to accidentally activate the touchscreen and flip a page. Adding a Kindle cover helps alleviate this while also protecting the touchscreen. The new Paperwhite comes with two components: the Kindle itself, and a micro USB charging cable. A wall adapter does not come with it, but since it can be charged from a computer with its handy micro USB port, it’s not a big deal. Amazon claims that the Kindle can charge in about four hours. When we booted up the Kindle, it was at 70% power. The setup depleted the power down to 50%, and we tested its charging power—it was completely charged in about an hour. Setting the Paperwhite up was very easy and user-friendly. It flits through the general settings, such as language selection, and then boots up, providing an easy bar to show its progress. You’ll be required to create or log into your Amazon account, and connect to the Wi-Fi, as well. After getting past this setup, the Paperwhite also took us through optional features, like connecting to Audible, Goodreads, Twitter, and Facebook. Once we set these up, the Kindle gave us a very brief overview of the Kindle, comprised of six tutorial screens which demonstrated the various aspects of the homepage: the Kindle store, which includes various sections, like “Recommended For You”; the Goodreads “Wish List”; and your library. Once the Kindle is set up, it’s easy to get reading. Simply press the Kindle Store button, search for a book you’d like to read, buy it. In under two minutes, the book is downloaded to your Kindle and you can read. What’s really convenient about the Kindle is that Amazon groups the books into different options catered to your browsing history. When we tested it, we played around with a couple sci-fi and fantasy books. One section, called “Recommended For You,” started providing titles within these genres, including new releases and classics. If none of those books tickle your fancy, you can simply go into the Kindle Store button at the top of the home interface and you can find books by genre, title, author, and ISBN. Keep in mind that the MOBI book format that Kindle devices use limits your choices somewhat. We took it to a number of local libraries, for example, and discovered that they don’t support this format, limiting options for acquiring books outside of the Kindle Store unless you use a program like Calibre to convert the format. The Goodreads app, located on the home interface’s top bar, also guides you to potential book choices. Using this app, you can search under the same categories Amazon provides. Tapping on a book allows you to see what others have said about it, its ratings, and similar books. When you find a book that interests you, by simply tapping the “Want to Read” button, you can add it to “Your Reading List,” which pops up on the right-hand side of the home interface. When we clicked on books on the reading list, the Goodreads list linked us to the Amazon page for the books in question, making this purchase a very quick process. The Paperwhite benefits from its 6-inch, 300ppi display to give you crisp, clear letters while reading. Tapping or swiping the display sides allows the user to flip through pages with ease, and returning to the home screen is a breeze by tapping the top of the Kindle display interface and tapping the home button. If the settings are not to your liking, then you can press the top of the Kindle screen, where a “Page Display” button will appear. From there, you can: alter the page display to larger letters; change the spacing between lines for a more compact look; and even change the fonts, including to one geared for those with reading conditions such as dyslexia. The six-inch, 300ppi display gives you crisp, clear letters while reading. In total, there are 10 fonts, five boldness settings, 14 font sizes, and 24 brightness LED brightness levels, making it very easy to customize your reading style to fit your needs. We tested these fonts in bright sunlight, darkness, and tilted it in case to check for distortion or color washouts. Each time, the displayi shined with crisp letters, readable from distances and from most angles. In bright light, there is a small glare, but adjusting the angle fixes this issue. While black and white, the clear quality of the e-reader makes it compatible with comic and graphic novels. When we tested it, we noted that the strict shades of gray detract from the vivid colors in these books, however. If you’d prefer Spiderman or Calvin and Hobbes to be at their best, this will not be the best device to view their hues. On the same page as requests to connect to social media, the Paperwhite offers to set parental controls. These controls can limit access to the internet and the Kindle Store. A nice feature with the controls is that while it can block access to the internet, there is also a “Kindle FreeTime” app. Using FreeTime, parents can set reading goals, badges, and awards for reading books. From there, parents can also monitor their children’s reading choices and the goals on an easy interface. Signing up for a free trial of Audible during setup gets you two free books of Amazon’s choosing for the first month. After that, Audible will cost $10 per month. The Paperwhite connects to speakers via Bluetooth enabled audio equipment. In testing it with other speakers and earphones, the audio didn’t break or buffer, even at great distances. We left the Paperwhite on one end of the house, walked up a flight of stairs into a room across the building, and the audio still played, crisp and clear. Keep in mind though that if you want to listen and read along, Audible doesn’t come with that feature on this device. One of the Paperwhite’s claims to fame in this new model is that it’s waterproof. So, naturally, we decided to test that theory — twice. We first ran the Paperwhite under a sink to see if anything happened. The only minor issue we noticed was that under the sink tap, the Paperwhite thought we were increasing the font settings. Otherwise, it worked (and still does) like a charm. Before submerging it into the bathtub, our second test, we charged it. Once it gets completely submerged, you cannot charge it until it’s completely dry or you risk water damage inside the Paperwhite. When underwater, we also noticed that it thought we were pressing buttons on the touchscreen when we really weren’t. It’s truly innovative that Amazon created a waterproof device, but we wouldn’t recommend letting it sit under the water for long, much less the 60 minute limit Amazon recommends. The Paperwhite’s 2GB of storage space holds roughly 1,100 books, meaning you can take a library on the go with the Paperwhite. Some of this space is used for the other software on the machine, which takes up about 1GB of data. Audiobooks, however, can run in the mid-hundreds of MB for size, if not larger. Add a few of these onto the 8GB Paperwhite and you’ll lose space quickly, especially since you can’t use a SD card. They also take longer than the usual minute or so for a regular book. When we tested out the Audible book, it took three minutes to download a chapter of the audiobook. If you’re solely using this Paperwhite for the Audible features, you may want to upgrade to the 32GB storage versus the 8GB storage. If you would still prefer to opt for the smaller storage, then you can simply delete any books by pressing and holding the book’s picture on the interface. A list of options will pop up, including a “Remove from Device” button, and with a tap, the book vanishes from the device. Amazon boasts their Kindles’ battery lives last for weeks without needing a charge. Throughout the week, we tested the Paperwhite for a few hours a day, filtering through the experimental browser, the various apps, and reading a good book. Sure enough, the battery life held up—one week later, and we were still at 40%. If you’re simply reading for extended hours, we think the battery would last a lot longer, as we noticed that the experimental browser used a lot of power loading websites. For around $100, the new Paperwhite is a great device. It sports a couple design flaws that we don’t like—namely, the thin bezel around the screen—but the price beats some of the pricier models. Considering the expense consumers can drop on one of these, the new Paperwhite model is a reasonably priced choice. The new Kindle Paperwhite is a perfect option for someone who wants a true e-reader without breaking the bank. There is admittedly a glut of e-readers on the market, and so we tested the new Paperwhite against the Kindle Oasis, which retails for more than double the Paperwhite. Both carry the same apps, features (i.e. Audible), and waterproof capabilities, making it easy to store and go whenever and wherever. The difference between these particular e-readers, however, is demonstrated by their designs. The Paperwhite is sleek and thicker at 6.3 x 4.6 x 0.3 inches (HWD). With the Oasis, on the other hand, it retains a boxy shape at 6.3 x 5.6 x 0.13-.33 inches. The dimensions make it thinner, but larger. Those who find it harder to grip the Paperwhite should definitely consider the Oasis. The Oasis case is plastic in lieu of the softer exterior the Paperwhite sports. The back is designed with a slope so that it’s easier to grip and can be used ambidextrously. There are also buttons for easy page-flipping without having to use the touch screen. However, that’s basically the only perk to spending around $250 for the Oasis. If this is a must-have, then the Oasis is the better option. However, if these features don’t matter, then the Paperwhite will save you around $150. Want to take a look at some other options? See our guide to the best e-readers. A full-featured e-reader that doesn't break the bank. With a sleek style, long battery life, a smooth interface, the 2018 Kindle Paperwhite is a great way to pack a library on the go. It comes with just enough additions and perks to make it a worthy investment for any consumer. Product Dimensions 6.6 x 4.6 x 0.3 in.